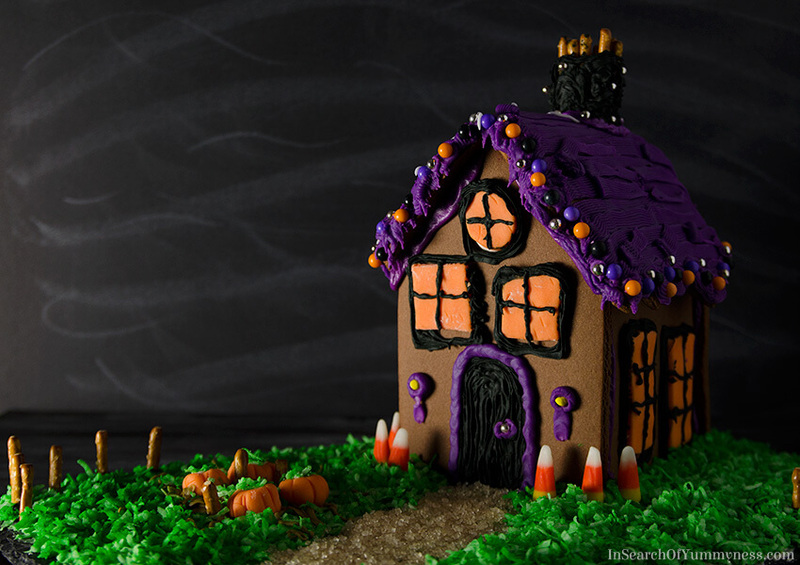 Here’s some inspiration to help you decorate your wilton haunted gingerbread house! Halloween is one of my favourite events of the year, which is weird because I am a huge wimp when it comes to scary stuff. I don’t like horror films, I barely got through watching the first two seasons of The Walking Dead (and I hid behind a cushion for most of it), and I refuse to walk into party shops during this time of year because most of the decorations creep me out. Instead, I prefer to use Halloween as an excuse to make scary things cute, like these adorable marshmallow bats! 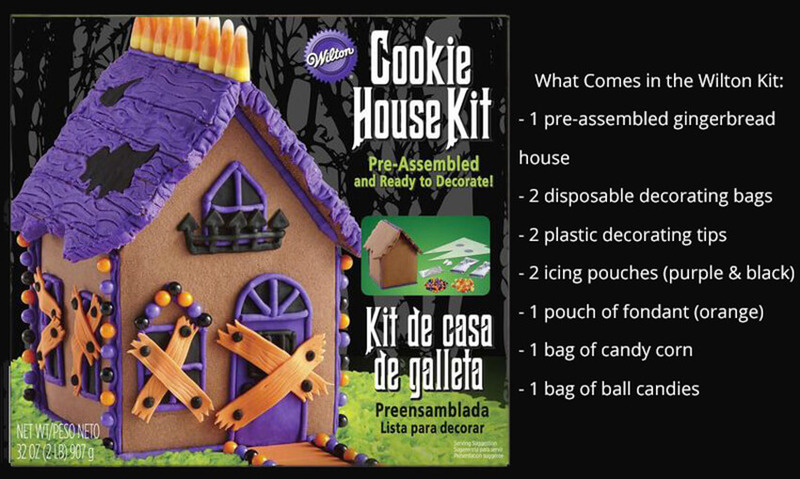 This year my mom and I couldn’t decide on what to make for Halloween, so we bought a Wilton Haunted Gingerbread Cookie House Kit from Walmart and decided to use that as a starting point. As we started putting it together, I realized that whatever my recipe was going to be, it needed to look like spiders! I whipped up the spider brownie bites recipe, while my mom worked on the Wilton Haunted Gingerbread Cookie House Kit. I helped a bit, but I was also suffering with a bad cold and a fever, so trying to do fine detail work wasn’t going so well. (I’ve been sick for over a week, but can only handle so much bed rest). My mom did such a great job on the house, I just had to show you how she decorated it! What follows isn’t a step-by-step guide, although there is one on the Wilton website if you need it. Instead, I’m hoping that you can use this blog post to get some ideas on how to decorate your own haunted house! 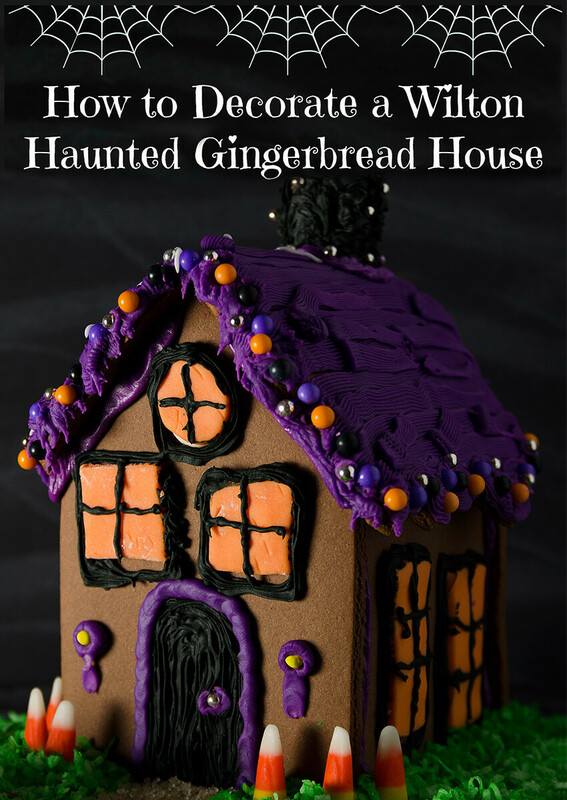 This year’s Wilton Haunted Gingerbread Cookie House Kit had a traditional gingerbread shape, which was nice but I’d love to try decorating their older model too! It had a spookier shape with three towers. You can see what it looked like in this blog post on Love From the Oven. 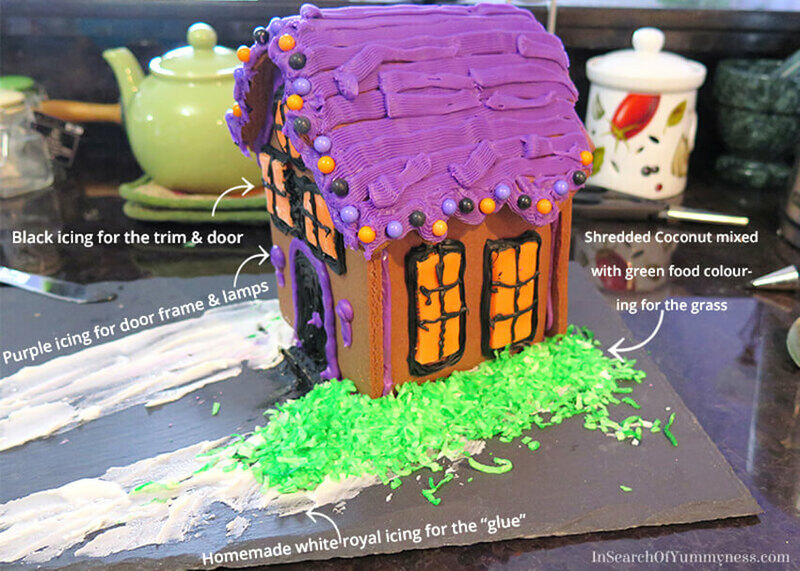 Anyhow, what was nice about this gingerbread house was that it came already glued together with purple icing. All we had to do was decorate it! We made pretty good use of the supplies that came with the kit, although my mom did choose to use her own metal decorating tips instead of the plastic ones. I piped on the roof with the purple icing, using the Wilton basketweave piping tip #48. After piping on long lines of icing, I added some shorter ones to look like broken boards. While the icing was still wet, I pushed in the round candies to make “lights” on the roof. Meanwhile, my mom rolled out the orange fondant that came with the kit, and cut out squares, rectangles and a circle for the windows. She stuck them on with some white royal icing that she made, but you can use icing from the kit to adhere them to the gingerbread. Once the fondant was glued on, my mom used the black icing from the kit to create the window trim. She piped the icing on the outside of the frames with the Wilton open star tip #18 (and on the door), and then used the small #2 round tip to make the bars on the windows. 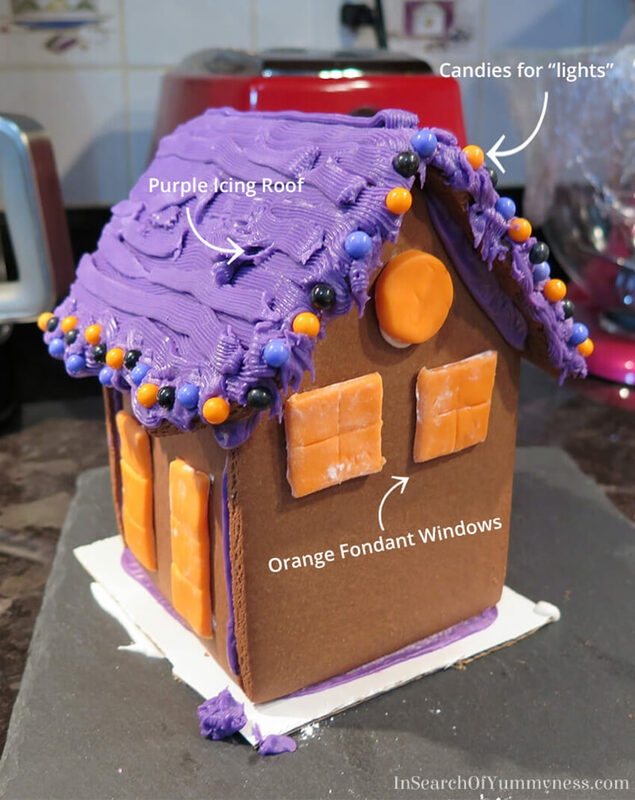 She then used the Wilton #3 round decorating tip to pipe the purple icing around the door, and to create the lights on the front of the house. Later, we stuck yellow candies (not included) into the lamps to create the bulbs. I mixed shredded coconut with lots of green food colouring to make the ultra-green grass for around the house. The green really makes the other colours pop! 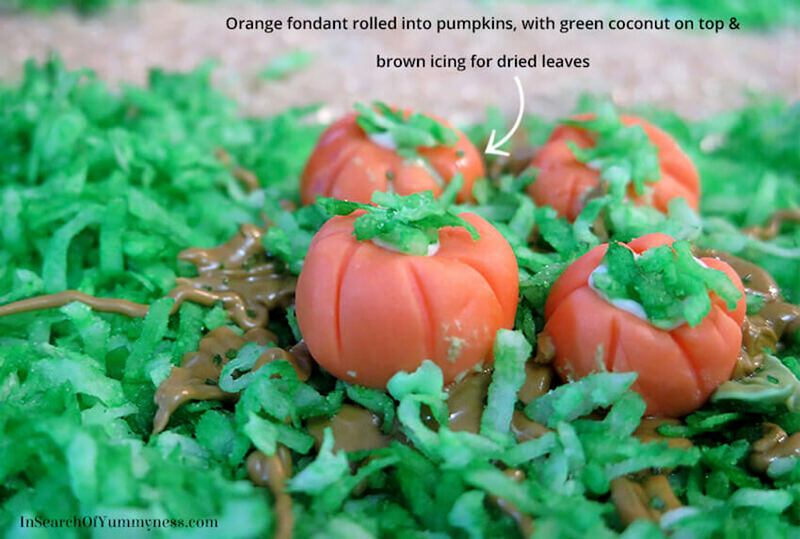 We thought a pumpkin patch would look cute, so my mom used some of the remaining fondant to create chubby little pumpkins, which I topped with more of the green coconut. 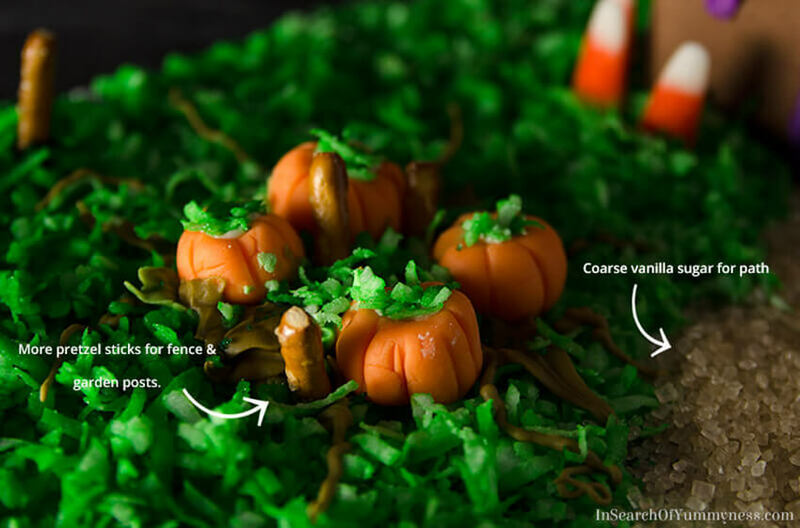 Coarse vanilla sugar from our pantry made an effective pathway in the display, and leftover pretzel sticks from my spider recipe worked perfectly as fence and garden posts. 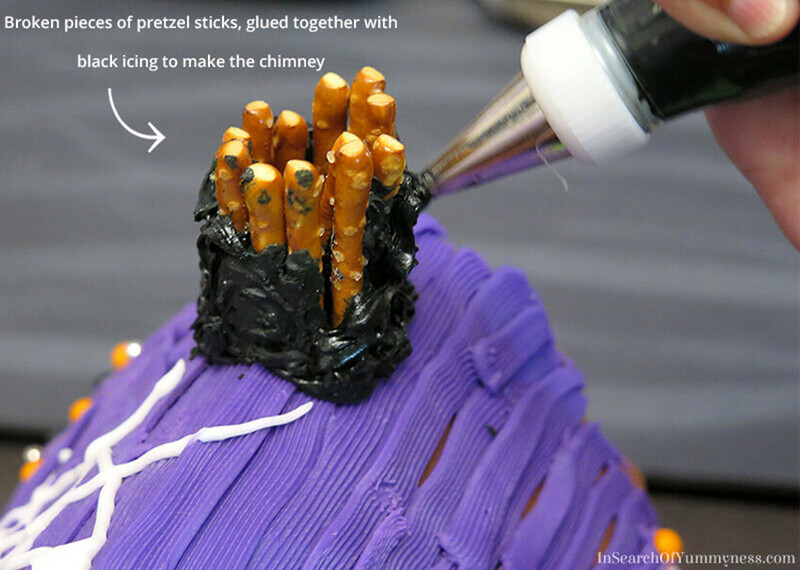 The house looked a bit sad without a spooky chimney, so we glued together some more pretzel sticks with the remaining black icing and set it aside. Once it was dry, my mom stuck it on the house with more black icing, piping up the sides around the entire thing. To finish it off, we stuck on some Silver dragées (which apparently are no longer considered to be edible? I mean no one is going to eat this house, but I’ve definitely eaten them in the past! ), and the candy corn that came with the house. I think the whole house took about 3 hours to decorate, including waiting for parts of the house to dry before adding more details. Working on a pre-assembled house is so much more fun than trying to glue the walls together on the flat-packed houses! Have you made a gingerbread house for a holiday other than Christmas? Let me know in the comments! This post is not sponsored by Wilton, despite the fact that I linked out to them so many times. I promise! Most of my mom’s cake decorating tools are from Wilton, as she’s been using their products for years. The house just so happens to be a Wilton product too, so I figured what the heck. Might as well let you know what I used and where to get it, so you can replicate these results.